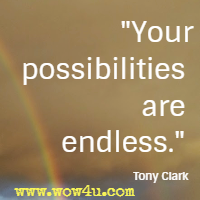 Be inspired by the wisdom in these Tony Clark quotes, from his book, thinkUcan. 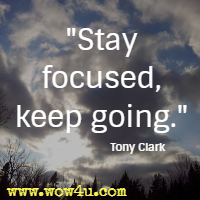 While Tony has achieved many successes in his life his latest endeavour is an online and offline training organisation, thinkUcan. He has authored the book, thinkUcan, read our review on this very inspiring book. "I guess the more I have done, the less fearful I have become, because experience has taught me that the worst case is rarely likely to occur." "Instead of being a person to whom things happened, I became a person who made things happen." "For me, the greatest joy is to reach out and engage with others; to help them see and realize their full potential and watch them grow and them move towards their own happiness." "No matter how bad we might think the world is, in my experience the vast majority of us want to rub along with our fellow men and very often buried beneath a gruff exterior, there is a generous sprit waiting to be revealed. "We are not stuck in the ruts of destiny, we have the power to break free, clear our vision and see a new life for ourselves." "Well, although taking control of your thoughts and creating compelling visualizations will go a long way to helping you achieve your dreams, you will need to do something more as well. You will have to take action." "I have discovered that I can't change the world, what I can change is how I react to it and it is no exaggeration to state; that one simple revelation has set me free." "Fear is there to warn you of the risks, too often it becomes the reason not to do something. Sure, you need to heed the warnings and at the same time learn to measure the risk based on reality not your imagination." 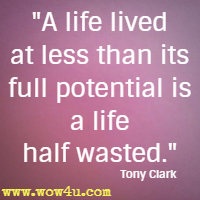 "A life lived at less than its full potential is a life half wasted." "If you find that you can't enjoy where you are right now, do something to change your situation. Take action. You have limited time, don't waste it." "Getting to know new people and gaining new friends is one of life's greatest pleasures. So conquer your fears and get out there." "The interesting thing about goals is that they often evolve and mutate even as we are working towards them. The more progress we make, the more we understand about them and sometimes, we change the way we see them. Sometimes we get a little side tracked. What is important to understand is that this is not neccarily a problem." "No matter where I go or who I encounter, my belief in the essential goodness and well-meaning nature of the overwhelming majority remains unshaken." 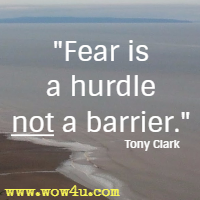 "Fear is a hurdle not a barrier." "Some of the most important decisions I have made might well have never been made or might have been very different if it hadn't been for the influence of the people in my life. We all need mentors." "If you want it, go for it." "'I'll be happy when…'is a false promise. The time to be happy is now." "Simply by putting my ambition out there it had mysteriously come spectacularly true and I was enjoying a lifestyle that some people only dream of." "Never assume you know it all. Ask and seek help, most people will fall over themselves to share their skills."